I was attempting to download some broker's mt4setup.exe and the connection kept timing out. I tried from two different computers in two different countries. After about 15 minutes, I got it to download in the Thailand location. But New York I am still getting "Timed out". 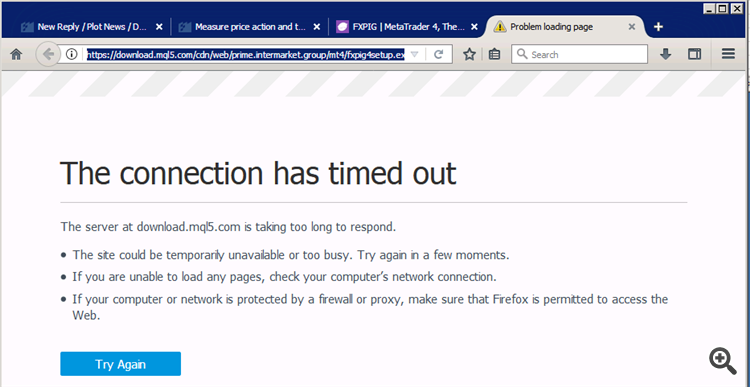 AwarenessForex: But New York I am still getting "Timed out". What do you expect us users to do about your network and that server? There is nothing wrong with the network connection on the server. These vps has 10gbps connection hosted in NY4. Come on now. I have no idea why there is connection issue. But someone send me the link privately from their own server or as email attachment, I can download without any problem. I still have the problem but a different broker (try to visit the cdn link of the mt4setup.exe url link from the server and the connection times out). Again, internet is fine, including live mt4 terminals login. Also, MQ closed their service desk, so we are supposed to report problems here. So can we get an honest answer as to why downloads do not work from some locations?